The Carl’s Bubbloid 4x4x5 & 4x5x5 are the co-operated project between Carl Hoff, David Ang and me. The Bubbloid 4x4x5 is originally called Bubbloid122, while the Bubbloid 4x5x5 is called Bubbloid112 . They both are the implementation of the concept of a shape-preserving corner-turning cuboid. The difference between the two variants are the number of pieces shared on moves in the same edge. In this case the edges of two dimensions have one piece shared between adjacent moves. The edges of the third dimension have two pieces shared between adjacent moves. 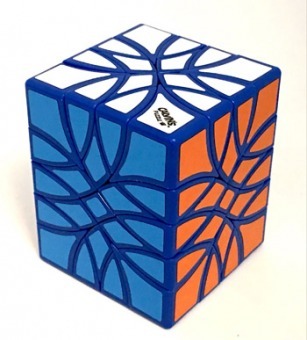 The mechanism do not have much corner-cutting feature as speed cubing cubes. They do turn acceptable, fun and challenge to solve. You have to retain the stickers to solve it. You won’t regret to try and play them on hand. We shall have black, white, and a limited blue edition.